While I spent most of my day outside working in my garden and yard… sometimes I need a break. The dentist ended up pulling my troublesome tooth… and it aches! I should come in and clean on my house… more than likely, I sit down and work on a spoon or two, and leave the dishes and clothes for later! It’s relaxing and fun… what can I say? Hey, before you leave… let’s do a q and a session, since it’s been a while. Post your questions and I’ll answer them soon! You asked for questions. I would love to hear how you do your spoons. 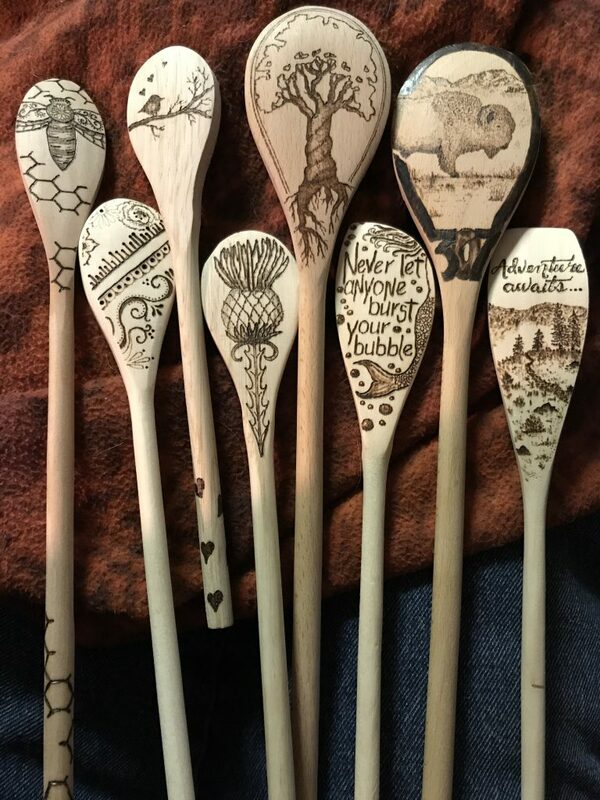 I make something for my daughters each Christmas and the spoons would be great. Do you drawn on the spoon first? What kind of woodburn set do you use? I have never wood burned are there different tips or something. Any advise you can give I would appreciate it. Those spoons are so well done and clever. Love them! Visiting my Dad and family in Powell in June. Would love to buy a few spoons. LOVE the bee spoon and the little bird, well all of them. Is Dirty Sally’s and Bee Healthy in Ten Sleep. Plan on making a drive that way. Recommendations for a lunch spot in Ten Sleep? What are your favorite birds or bird stories. Do you sell these in Ten Sleep? I’d really like to buy an Adventure Awaits spoon for my camper. Can you make one with the design going from the bottom to the top instead of the top to bottom as shown? I’d like to hang it on the wall. I do sell them myself and at Dirty Sally’s and Bee Healthy. I can make you one your way and you can pick it up this summer! No question. Just wanted to say I LOVE the “adventure awaits” spoon.